The Manhattan-based architecture firm, Hou de Sousa, is on a winning streak this spring. This past March, the firm won Re-Ball!, a competition to repurpose over 650,000 plastic balls from a previous design exhibit into an installation for an abandoned underground trolley station in Washington D.C. (Their playful and interactive wonderland, titled Raise/RAZE, is set to open April 30.) And now the firm has won this year’s Folly competition in New York, hosted by the Architectural League of New York and the Socrates Sculpture Park. The theme this year was “function,” a break from the themes of years past, that drew from the literal meaning of folly: a blend of architecture and sculpture that doesn’t really serve a useful purpose. (These structures were once popular in 18th century England and French patrician gardens.) While the Folly competition is based in New York, it is open to global emerging architects. Hou de Sousa’s proposal, Sticks, addresses the function theme through an adaptable concept. 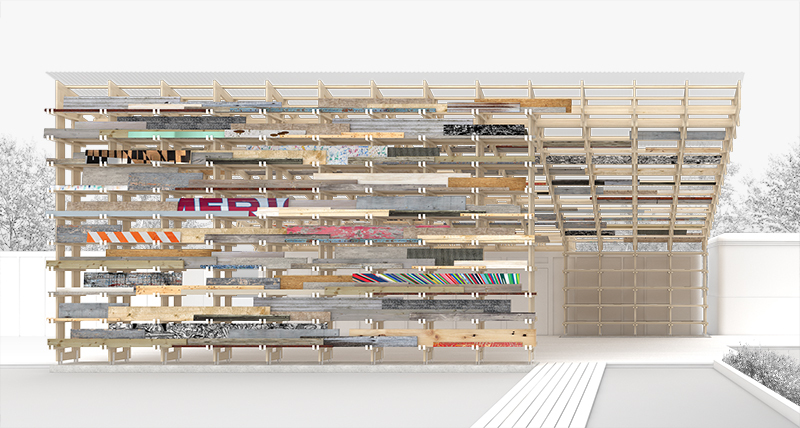 Using interconnected lumber held together with webbing, the design supports an array of repurposed on-site scrap materials that provide shade and 18 inch deep shelves for possible future art exhibits. 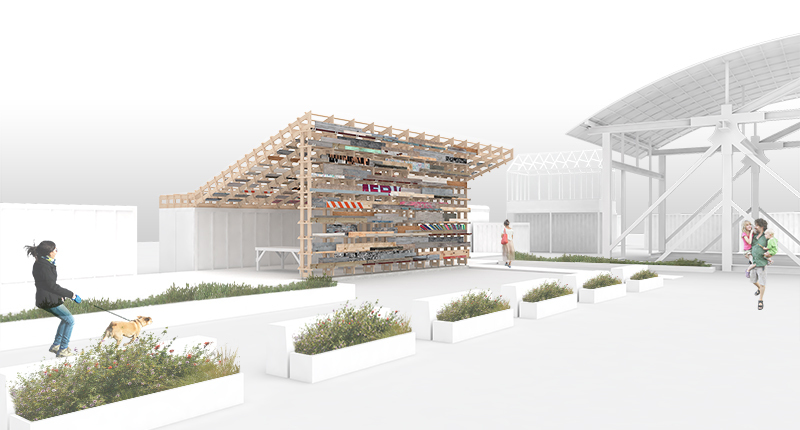 Their project takes advantage of an adjacent shipping container to help support the structure. 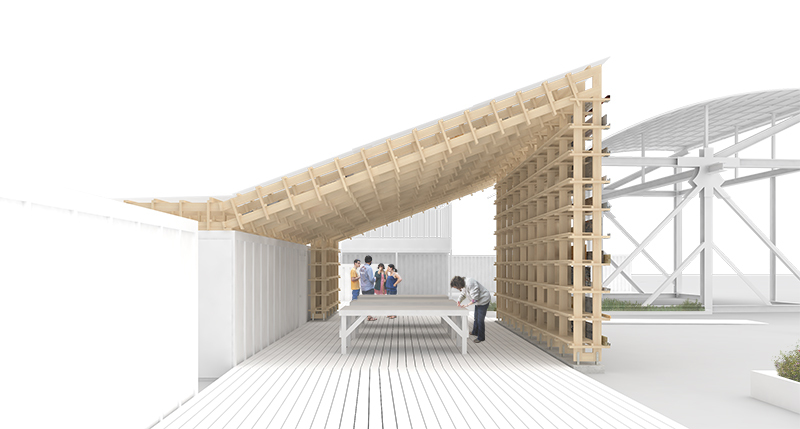 It will serve as “a hub for Socrates Sculpture Park’s Education Studio, which hosts over 10,000 students annually,” says the Socrates Sculpture Park in a press release. 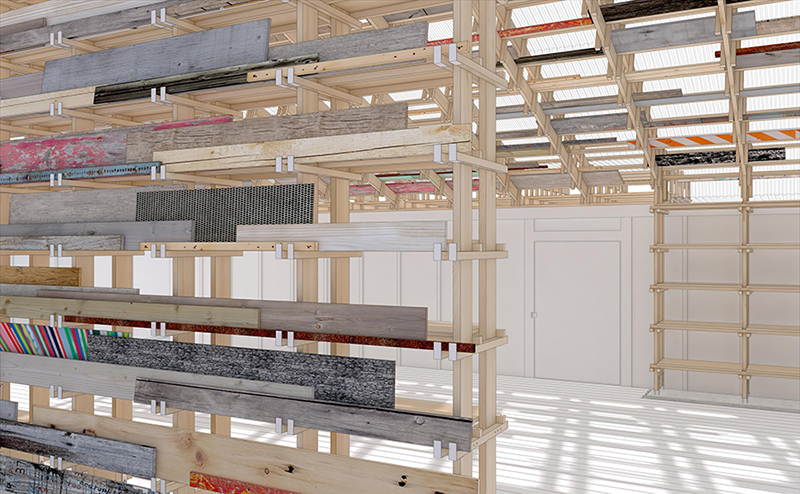 Hou de Sousa will build their project on site this May and June for a July 9 opening in the Socrates Sculpture Park in Long Island City, Queens. IK Studio won the competition last year, with the plywood pavilion Torqueing Spheres. Hou de Sousa’s Folly entry last year, Mochi, garnered a Notable Entry for their colorful domed quilt of ravioli-like inflated plastic bags. The Folly competition is privately and publicly supported, with public funds coming in part from the New York State Council on the Arts.